Okidoki, so after reading a TON of posts on engine swaps, I could not find much info on putting a 931 engine into my 924. With it having the same block, it seems like a pretty straight forward cost effective swap. What is needed to wedge one of these into a 924? All info, tips, partslists and well, anything you can think of will be appreciated. The path of least resistance would be to swap a complete 931 driveline and exhaust. Heat shields, different wiring requirements, etc, make this a herculean task unless you have a whole parts car. Blew the 924 NA up more or less; slow leak head gasket failure. I have a guy near me with a 931 motor/turbo and plumbing. Motor forward, no bell housing ETC. I figure if I'm going to rebuild it; why not upgrade? Like sparky, the 931 swap seems like a very and justifiably reasonable option. I don't have a computer box in my car under the steering wheel, the donor 931 and my other car (a 1980 NA) do have the magic box in it. What's it even do (CIS + computer = WHY)? 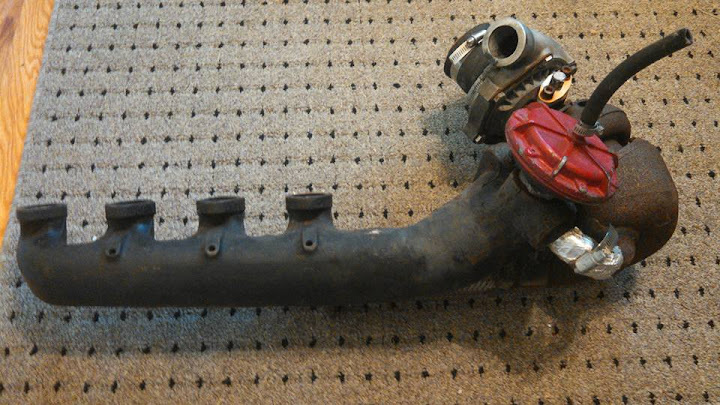 What's different with the wiring between the NA and Turbo systems? The turbo waste gate system is mechanical right? Sick after an industrial accident; banned from the shop for a bit. Stand by! The box you're referring to is the Lambda / O2 system. It is used to modify fuel delivery via the frequency valve on North American cars. If both cars are 1980, the wiring differences should be fairly minimal, as NA and 931 cars both used the CD-based ignition. Detailed inspection of the wiring charts (which I have NOT done) would reveal any significant differences. The one thing in particular that will be different is the fuel pump relay circuit, as the NA will lack the overboost protection switch that's in the 931 charge tube, so your recipient car will lack the necessary wiring. The other huge challenge will be clutch actuation. You will need the bell housing from the 931 motor, and you will need the entire master-slave-pedal assembly, along with the proper fluid reservoir and all associated lines. This is not insurmountable, as I have done this conversion on a 1978 chassis, but you will need to source all of the parts. Then you have to figure out what to do about the torque tube since the NA has the smaller 20mm driveshaft and input shaft at the trans. Ideally, you should be swapping in the 931 stuff, which means you have to drop the entire rear suspension in order to get the old torque tube out and a new one installed, and you'll need to change the trans as well. After that, you'll need to address the entire exhaust system (manifold, down pipe, dump pipe, j-pipe, cat section, and catback), including all of the necessary hangers. So as you can see, getting just the engine is not going to be of much help. You really need an entire donor car...and at that point, you have to ask yourself, why put all the good bits into the NA chassis??? Forget all the crusty wiring, throw it all away..
Go standalone EFI and ditch the CIS too, or FrankenCIS control of the CIS in the first place for about another $1k either way, fresh wiring, including ignition, and easy 250-300+HP.. Looking forward to your demonstration of this concept. I'm turnkey pushing around 250 on OEM CIS right now, you need a video? So is Morghen.. And Shuric is at 320-330 with megasquirt..
Why isn't shaggy at 1Bar+? Bummer! Found a guy near me with a 931 motor out of an 80 (would be dropping it in a 79 - no computer under the steering wheel), but he sold the rest of the car. The bell housing, tube and transmission apparently went with the car. I didn't know the torque tube shaft diameter was different. I looked through the literature: noticed the over boost protection switch and fuel cut off circuit. Dyno/video +1! That's awesome. Can you refer me to the thread/s on modifying the OEM CIS up to 250+? I have a COMPLETE Windblown system, and a second partial system. I am in the early stages of prototyping a stainless steel version of this header that will be adaptable to both a 931 AND a 924 head, allowing us to have essentially a bolt-on path to modern turbochargers. Yes, it's a log manifold. No it's not ideal. BUT. It comes standard with a T4 flange. Aside from Nitrous, I think this is the easiest path to get an NA to ~200 BHP. Ok rasta I'll get right on that..
My car @ 250ish is just a guess, but how much power do you or anyone else estimate a 2.0 with a k26/6 compressor @ 1Bar is making with excellent charge cooling? Do you seriously mean to tell me and everyone on this board that 250-300 HP is not a reasonable goal for a turbo 924 with proper engine/fuel management? Sounds pretty reasonable if not even conservative to me..
Why are you stuck on this "2.0 can't make any power" BS? Is that what your mechanic told you? I just proved in another thread that the OEM US 931 fuel distributor is capable of supplying around 330HP worth of fuel..
2nd post pg3 http://924board.org/viewtopic.php?t=41465&start=30 incase you missed it..
Don't you have pistons, an IC and all sorts of other expensive goodies on your car? WTF are you doing dinking around under a Bar of boost? According to my real world tests I have found that the (my) US 931 fuel distributor is capable of around 330HP at maximum metering plate travel, a touch over 100psi system pressure, and minimum lower chamber pressure. I honestly don't know what power I'm making but I have a quite nice FMIC, a compressor from a 944 turbo/951, and my boost has been set at 1 Bar with a S1 2664 compressor and now the bigger /6 compressor for many many runs now and no POP yet.. Runs cherry, and my boost gauge is right off the #1 intake valve as close to the cylinder as you can reasonably get so no cheating there..
My system is 7.05 Bar and my warm control is 4.05 Bar, no internal mods, and no bang, all seems well..
You or anyone else should maybe not try what I am running because it's likely quite a risk but I have not heard detonation even one time and still no pop/bang/blown anything yet. Unless you count blowing a turbo but I don't find that applicable, it was my stupid mistake.. Here is my IC thread, you WILL need one of these to make power, I think.. Sorry, I do not have any video or a dyno to prove anything and for all you or anyone else knows my car is sitting with a rod through the block or I may have no car at all. As always don't take my word for it, fact check anything I say before you take it as advice please, twice.. I'd hope you'd agree that "2.0 can't make no power" and "300+ hp easy" are qualitatively different statements. The quality difference between your modified format out of context versions of my statements has no bearing on the subject at hand, but I prefer "300+ hp easy" myself because it has a bigger number and sounds cooler though it is in no way an accurate summary of what I wrote..